In 1984, Charlie Spedding finished a race one place behind Treacy. He was quite a bit closer. Two seconds. 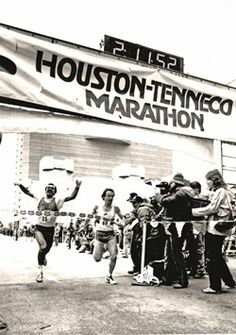 The race was the Olympic Marathon in 1984, a race won by Carlos Lopes of Portugal. Both Lopes and Treacy had the pedigree, each having won the World Cross-Country Championships twice. Spedding’s finish was a surprise. He has written an autobiography, and however unknown he was to me before, his Los Angeles finish remains stunning. But the book, “From Last To First,” goes well beyond I Trained/I Raced. It has a core lesson from which all serious runners can learn. Bedeviled by injury, especially in his left Achilles tendon (early on he came within seconds of dying when he had an allergic reaction to an anesthetic while being prepped for surgery on that tendon), how did he win a bronze medal in Los Angeles? How did he get, and still hold, the English best in the Marathon? How, after barely making the British team after injury and dismal result after dismal result did he end up sixth, and the first Brit, in the Seoul Marathon? The core of the book, and what makes it more than I Trained/I Raced, is Spedding’s ability to peak. The flip-side to this was his relative inability to be competitive in other races. He spent a chunk of time in the U.S., chiefly in the Boston area, and appeared at some of the top races of the time, Peachtree, Gasparrilla, Falmouth, always running well but not great. The gold is Chapter 6, “The Beer Drinker’s Guide to Sports Psychology.” He describes sitting in a pub in Newcastle after missing a train to his home in Durham with a pint, a notebook, and a pencil. The obvious question popped into my head. What precisely did I mean by successful? I knew that I wanted to be successful, but I was shocked to realise that I had never really defined it. I thought about times, victories, medals and championships, but struggled to identify a performance that I could call a success because I didn’t know what I was capable of achieving. Everything I thought of was an unknown; it might be too ambitious, it might not. I didn’t want to define success as something I may not be able to do. I decided that success was becoming the best I could be, whatever that was. I wanted to get better and better until I couldn’t improve any more. Again, it sounds new-agey, but it proves itself with his performance. There is another psychological trick he had. “Perfect.” He recoils at the (common) use of “hard” to describe races and workouts. He says he knew Deke was no threat in Seoul because early on when Deke asked what the 3 mile split was. “I told him we were doing about 2:09 pace, to which he replied, ‘In this heat — we are all going to die! '” That was not the mind-set early in a marathon. Training should be well-conceived and properly-executed. Each run has a purpose. No more, no less. Workouts are to be done at the appropriate pace, no faster. This, of course, is a hallmark of much of the training literature, “Daniels’ Running Formula” comes immediately to mind, but if you characterize runs not as “hard” or “easy” but as “perfect” in the context of the overall training plan the pain of those 1200 intervals just might not be as difficult as it might otherwise be. Seoul was the last marathon Spedding would finish. Dave Bedford, newly installed as the race director of London, offered him a princely sum as an appearance fee for the 1989 race, which Spedding agreed to take, but injury forced him to withdraw a week ahead of time. Instead of going part-way and DNFing, he was straight with Bedford, and he ended up getting a quarter of the fee. He got a large appearance fee for the Beijing Marathon later that year, but events in Tiananmen Square led him to back out (and surrender the fee). He withdrew from London 1990, and started the Fukuoka Marathon in December, but was forced to drop out at 12 with a pulled calf muscle. Thirty-eight at the time, he retired. Somewhat wistfully, he notes that he made a bargain in Seoul — when he was “running on empty” and thinking of nothing except moving one yard at a time — that it would be his last marathon if he could only hold on to sixth. And he did. And it was. Spedding makes no attempt to delve into his personal life except as is absolutely necessary. That he got married comes literally out of the blue with the following from page 153, “Life goes on and a week later I was getting married.” She remains unnamed and is not mentioned again until she and Spedding share a house near Boston in preparation for Seoul. I’ve long thought Kenny Moore’s “The Long Blue Line: A Rerun,” first published in Sports Illustrated and Chapter 1 of his “Best Efforts,” in which he intertwines the events of the 1972 Munich Olympics with his own experience in the Marathon of those Games — he finished fourth — was the epitome of an elite race report. But Chapter 1 of “from last to first,” “Los Angeles,” compares quite favorably to it, as does the chapter on Seoul. Finally, in my review of “Born to Run,” I noted that I had a core problem with the implied superiority of the characters (although I was chided by someone who said I had completely missed the point and that the theme of that book was that ordinary people could do extraordinary things, which I in turn think missed the point). For those who feel, as I do and as Spedding writes, that “Success is measured by how much I fulfill the talent I was born with,” and who labor long and hard to develop that talent, this book reveals Spedding not as someone superior but as someone who was fast and smart and focused. And with whom you’d like to go for a run. Wow, Joe, stellar book review! I could swear I was reading the NYT Sunday section. “What teenager would long to do the same activity that their mother and father do badly?” cracked me up no end, I might have to read the book just because of that. You convinced me. I’ve just added it to the top of my wishlist. Thanks for the review Joe. I remember the LA Olympic marathon well. Didn’t know about Houston – no wonder they have judges and photo-finish for marathons these days! 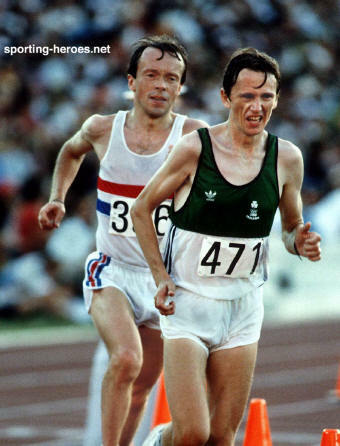 I’d forgotten about his sixth in Seoul – I’d like to think that Deek’s comment about how hot it was for a 2:09 pace was just Deek trying to put doubt into Spedding’s mind. Still, it makes me wonder if Deek would swap his world record and 2:07:51 PB for an Olympic medal. Interesting about Spedding’s definition of “success”. Doing the best you can possibly be with the talent you were born with is a goal that would serve today’s young runners well. Better I think than goals like “I’ll be successful if I win an Olympic medal”, or “I want to make the US Olympic team”. I forgot to mention something about “perfect training”. There was a flotrack video about Ryan Hall (called workout Wednesday, but now gone? ), where he’s running 10 x 800m with a 1 minute jog – the ‘up’ ones in 2:16ish, downs in 2:04ish. He says after that the session was no more important than the previous day’s, or the next day’s long run – just part of the total training. Ewen, in Seoul past 20 (and he is very critical of the officials for not allowing anything but runners’ own bottles every 5K, unlike LA), he falls behind the lead group of 5 but claws his way back. He slowly got past Ikangaa for fifth. As I ran on I knew Ikangaa was beaten, but the others were out of sight in front of me. This part of the course was tree-lined and there were no spectators, and no officials. It was very strange. I was fifth in the Olympic marathon, running as hard as I could along an empty, silent road, all by myself. Unfortunately my isolation didn’t last as long as I had hoped. I heard footsteps behind me. I didn’t look round — I know what was happening. The footsteps got closer, and it was the Australian, Steve Moneghetti, who came past me. I would normally try to latch on to somebody as they went past, but I didn’t try to because I knew that any change in my cadence or rhythm was likely to tip me over the edge that I was clinging to. If I can’t be fourth, I’ll be fifth. If I can’t be fifth, I’ll be sixth. If I can’t be sixth . . . . no, no, no. I will not be seventh. I must hang on to sixth. Sixth is alright. Seventh is nowhere. I have to hold on to this. I think the great thing about Charlie was that he gave all of us hope – hope that as good club runners we could hit a rich vein of form and with a lot of luck and a lot of hard work enjoy a moment of fame. That’s interesting. My thoughts are that you can’t be on the podium in the Olympics, fifth and sixth places are better than fourth. Maybe in the current era you’d be promising yourself top-ten for a final marathon? Deek may have run one too many with his 26th in Barcelona, but it did make four Olympic marathon finishes. Also interesting about ‘own bottles’. In Beijing Wanjiru and others just went for plain water much of the time. At 2:06 pace the luxury of making sure you get your own bottle is probably not worth the 10 metres you might lose. By the way, the 800 times for Hall were 2:17 to 2:14, not 2:04.